Teacher Education through Active Engagement identifies and addresses a contemporary issue: the ways in which teaching and teacher education are articulated by politicians, civil servants, business leaders and educational entrepreneurs intent on profit-making in the current global neoliberal policy context. This is often characterised by narrow and ill-conceived ideas about teacher characteristics and competences; recruiting and fast-tracking graduates from elsewhere into the profession; the reform of teacher training with less emphasis on theory and academic study; a narrow focus on teachers’ core skills; and the promotion of training in model ‘teaching schools’. In this book contributors challenge this conceptualisation and demonstrate practitioners’ necessary intellectual activity to wrest back professional control. 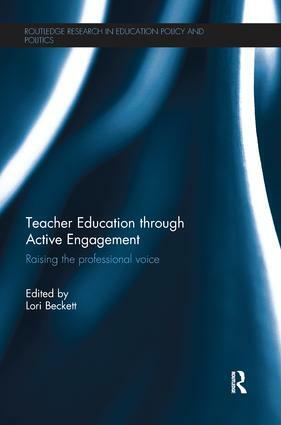 By drawing on practice-focused research carried out in sites of educational policy and practice, each chapter exemplifies for teachers, student teachers and teacher educators the sort of ‘knowledge work’ to coordinate a professional reply to non-educationalists who dictate the terms of teaching and teacher education. The book provides directions for encouraging critical thinking, analytical skills and political activism, which consider the needs and interests of diverse children and young people in real classrooms, real schools and real communities. Illustrated throughout with practice-focused research and drawing on the historical case of Winifred Mercier and her colleagues at the City of Leeds training college who challenged the establishment to leave a legacy of professional control, the book will appeal to practitioners, academics and researchers in the fields of teacher education and education studies. Regimes of control and teacher educators’ Janus face?